Barthel Bruyn’s oeuvre focused on religious painting and portraiture, and he was particularly renowned in his own time for his work in the latter genre. He was also the founding figure of a school of portraiture in Cologne, a city that had not previously been particularly active in this field. 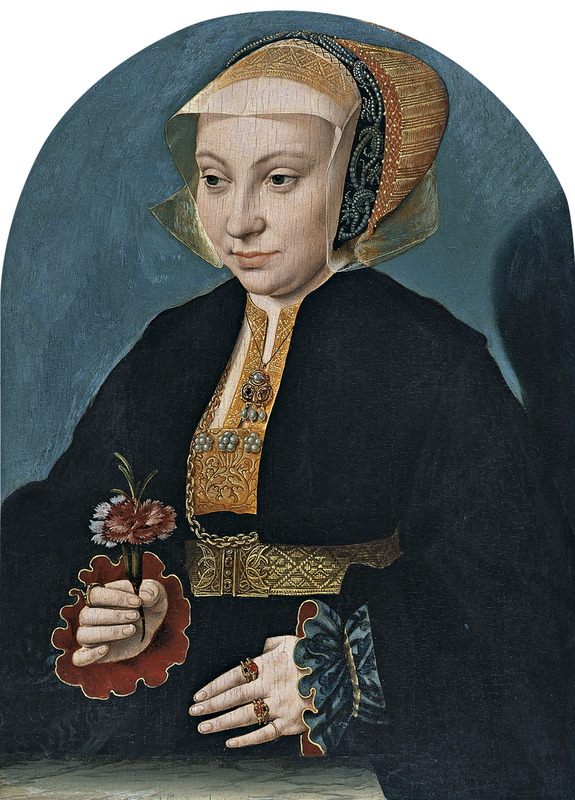 Bruyn depicted his sitters in a realistic manner, initially influenced by Netherlandish models, particularly the work of Joos van Cleve, and later from the 1530s by Hans Holbein the Younger, one of Germany’s greatest portrait painters. In contrast to his religious compositions, Bruyn’s portraits are neither documented nor signed and his corpus has been established on the basis of comparison with his religious paintings. Not only did Bruyn capture the physical appearance of his sitters, who belonged to the highest ranks of society, but he also included details referring to their personalities and professions. His images offer veiled allusions to the interior world of these individuals who are depicted in half-length format usually against a neutral background although on occasions Bruyn incorporated landscapes and interiors. These two panels depict a couple, using the traditional format in which the man is on the left and the woman on the right. The two panels are almost identical in size, with arched tops, identical blue backgrounds and the light falling from the left, projecting heavy shadows on the right. They also share a marble ledge in front of them, which terminates in the right-hand panel. The two oils were in the Rohoncz collection in 1930 and were exhibited at the Neue Pinakothek in Munich. Prior to that they were in a private collection in St Petersburg and in the Mandl collection in Wiesbaden. Bruyn depicted all the elements with precise detail, achieving rich, soft nuances in the woman’s face, characterised by a slight smile. In the male portrait the attention focuses on the face and hands, which stand out against the hat and the dark clothing respectively. In his left hand he holds a delicately pierced pomander and has a ring with a coat-of-arms on his index finger. This bears three black leaves of clover and has been identified as the coat-of-arms of the Weinsberg family in Cologne. The figure of the wife contrasts with the austerity of her husband due to the quantity and value of the jewellery that adorns her dress. Bruyn was equally careful in his depiction of the hands, one of them holding a pink, as he was in the ornate decoration of the belt, the stomacher and the headdress. Attempts to identify the male sitter with various specific members of the Weinsberg family have so far proved unsuccessful.